the projections for greenhouse gas emissions and other radiatively active substances were harmonized for the base year to historical inventories. Nine of these harmonized SSP IAM emissions projections were provided to the ScenarioMIP of CMIP6 (the Climate Modelling Intercomparison Project 6) and will be part of the detailed assessment of possible future climate changes. For a citation of the data please see here. The SSP database aims at the documentation of quantitative projections of the so-called Shared Socioeconomic Pathways (SSPs) and related Integrated Assessment scenarios (for an overview see Riahi et al, 2017). . The SSPs are part of a new framework that the climate change research community has adopted to facilitate the integrated analysis of future climate impacts, vulnerabilities, adaptation, and mitigation. Information about the scenario process and the SSP framework can be found in Moss et al. (2010), van Vuuren et al. (2014) and O‘Neil et al. (2014) and Kriegler et al. (2014). The framework is built around a matrix that combines climate forcing on one axis (as represented by the Representative Concentration Pathways: van Vuuren et al, 2011 ) and socio-economic conditions on the other. Together, these two axes describe situations in which mitigation, adaptation and residual climate damage can be evaluated. The SSP quantifications build upon the collaborative effort between the IAV and IAM community, which have met in a series of meetings and identified a limited set of five SSP storylines/narratives (O‘Neill et al, 2012). The narratives describe the main characteristics of the SSP future development pathways. They served as the starting point for the identification of internally consistent assumptions for the quantification of SSP elements. A range of different modeling tools were used to develop quantifications of these storylines, including factors like population, economic development, land use and energy use. For each SSP a single population and urbanization scenario, developed by the International Institute for Applied Systems Analysis (IIASA) and the National Center for Atmospheric Research (NCAR), is provided. For GDP, three alternative interpretations of the SSPs by the teams from the Organization for Economic Co-operation and Development (OECD), the International Institute for Applied Systems Analysis (IIASA) and the Potsdam Institute for Climate Impact Research (PIK) have been developed. The GDP projections are based on harmonized assumptions for the interpretation of the SSP storylines in terms of the main drivers of economic growth. They differ however with respect to the employed methodology and outcomes. In case users can only use one interpretation of the SSPs, for each SSP a single ‘illustrative’ case has been selected. The ‘illustrative’ SSP should not be interpreted as the central or representative case. In the selection of the ‘illustrative’ cases, we have currently selected all SSPs from one team (OECD). It is recommended to use the GDP projections by all teams to test the sensitivity of the results due to different GDP assumptions. methods and assumptions that were used for the development of the SSP population, urbanization, and GDP projections (IIASA, PIK, OECD). The data included in the database is shown as reported by the individual modelling teams. Harmonization of the base year data has been done only for the CMIP6 emissions (Gidden et al, forthcoming), and the resulting climate projections which are based on a common climate model for all SSPs (for further information, see the SSP study protocol). For specific purposes, harmonization of base year data might be required. An example of such an exercise are the selected SSP scenarios for ScenarioMIP for which harmonized land and emissions information is under preparation. At this point of time, we expect that further data for specific use of the SSPs in other research activities to become available over time. The SSP database has been established jointly by the Working Group on ?Quantitative SSP Data and IAM Scenarios? of ICONICS, and the ?Scientific Working Group (SWG) on Scenarios? of the Integrated Assessment Modeling Consortium (IAMC). The data has undergone extensive internal and external review. First preliminary interpretations of the basic SSP elements were made publicly available in May 2012, and were subsequently updated in March 2013 in response to a community review. In May 2015 (Version 1.0) the first set of preliminary IAM scenarios were posted, and were updated in October 2016 (Version 1.1). 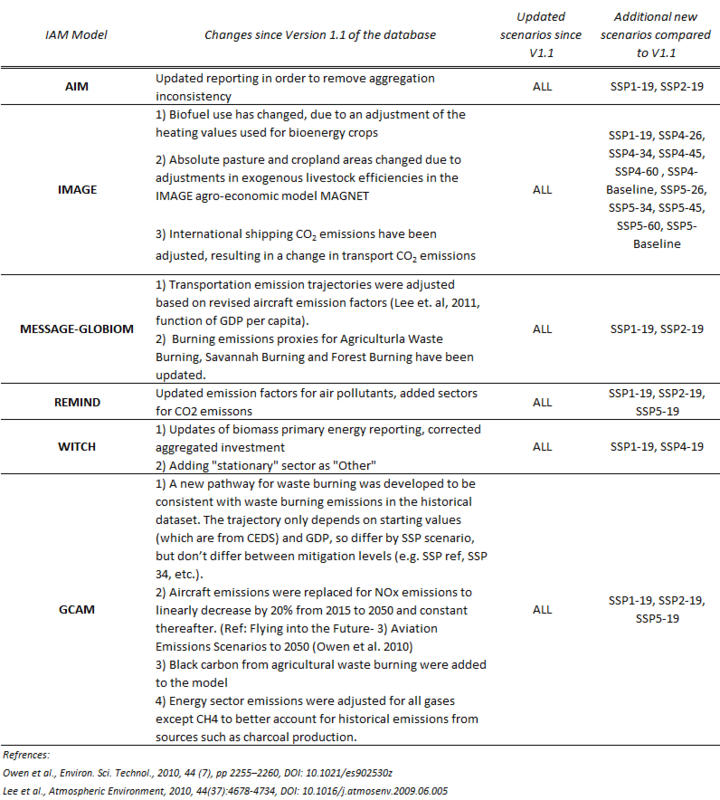 An extended SSP dataset including additional scenarios and the harmonized emissions for CMIP6 were posted in December 2018. In the Release Version 1.1> (October 2016) the SSP database was extended with scenario data on Integrated Assessment Model (IAM) elaborations of the SSPs. The scenarios provide detailed information on energy, land-use, and emissions projections for the SSPs. The scenario data complemented earlier information on the basic economic and demographic elements of the SSPs posted in March 2013. Release Version 1.0 (March 2013) was the first release of the SSP database with focus on the basic elements of the SSPs, comprising alternative economic, demographic, and urbanization projections. The content of the SSP database and any derived analysis may only be used for non-commercial scientific publications, articles, educational purposes, figures and data tables provided that the source reference pursuant to section ‘Required citation’ is included and all relevant publications are correctly cited. Partial reproductions of the database content may be stored in online repositories, if this is necessary to comply with a journal?s data archiving and access requirements. Such reproductions must be limited to the scope of the manuscript in question, and must include a hyperlink to the source database hosted at https://tntcat.iiasa.ac.at/SspDb and the download date from the source database. However, any wholesale duplication, translation, reworking, processing, arrangement, transformation, or reproduction through the internet or any other channels, of the https://tntcat.iiasa.ac.at/SspDb for commercial or non-commercial purposes is not permitted without the explicit written approval of IIASA. When using the data please cite the references as described here. With respect to information available from this website, neither IIASA nor any of its employees make any warranty, expressed or implied, including warranties of merchantability and fitness for a particular purpose, nor does IIASA assume any legal liability or responsibility for the accuracy, completeness, or usefulness of any information, product, or process disclosed. The software is provided on an 'as is' basis and IIASA disclaims all liability of any kind arising out of the use, or inability to use, the databases and all information and data contained within them. Parts of the website or the underlying database might be extended, changed or partly or completely deleted by IIASA without further announcement. This website may contain opinions and statements from external websites. Hyperlinks to non-IIASA Internet sites do not imply any official endorsement of, or responsibility for, the opinions, ideas, data or products presented at these locations nor guarantee the validity of the information provided. The sole purpose of links to other sites is to indicate further information available on related topics. A short tutorial on the use of the web database can be found below. If you experience technical problems with this database, please contact the SSP Database Administrator. At the upper end of the browser window five navigation tabs can be found that provide different functionality of the web database. These five tabs are described in more detail in the following section. The About tab provides information about the database and gives instructions on how to use the database. With exception of the About tab which can be viewed without special permissions, all other tabs require a valid user account (login and password) for the database. After entering the credentials the four additional tabs to navigate the database can be accessed. The first three tabs, i.e. Series, Countries and Scatter, all allow to view the scenarios in the database. Which scenarios can be viewed depends on the individual user permissions (see User account). The difference between these three tabs for viewing is the way how scenario data can be combined for viewing. The Countries tab allows selecting a single variable from multiple scenarios and countries. The preview graph on the right is always a line graph and is most useful to compare trends across different scenarios (and models) in one or multiple countries. The Scatter tab allows to look at the relationship between two quantities. The Variables navigation tree has been split into two, one for x-axis data and one for y-axis data, both of which also allow looking at specific quantities and growth rates. (1.) Regions: In the upper left area of the screen is a field named Regions. Depending on the tab (see above) you may select one or multiple regions for which the data is shown on the screen. Generally the regions are organized in the two folders Compare and Model Name. While in the Compare folder you can find regions that are (approximately) defined across many models (World, five macro regions and seven countries commonly compared in modeling comparison exercises, see Region definitions), the Model name folder contains the native regions that you report to the database. (2.) Scenarios: This field includes the list of scenarios from which one or more scenarios can be selected. In addition to scenarios, for a number of variables historical and base year data can be shown to compare with scenario results. Note that historical data is only available for the regions in the Compare folder (see also previous paragraph) and that currently only some emission and energy variables are covered. Further, displaying historical data is at the moment restricted to the Sectors tab. (3.) Variables: In this field the variables can be selected for which the data is shown on the screen. Note that in the Sectors tab it is necessary to not only required to tick one or multiple variables for selection, but also to mark a variable name (highlighted in blue) for the graph on the right hand side to be updated. It is not important which variable or variable category is marked to initiate the graph update. In addition to looking at raw time series data, there is also the possibility to look at specific quantities (e.g., per GDP or per capita) and growth rates. In the header of the Variables navigation tree (#3) you will find two new drop down menus that allow to select these features. The left one allows to switch between raw data and growth rates and the right on between raw data, per GDP (MER or PPP) and per capita. They can be applied together, e.g. for looking at growth of GDP per capita. R5.2OECD = Includes the OECD 90 and EU member states and candidates. R5.2REF = Countries from the Reforming Economies of Eastern Europe and the Former Soviet Union. R5.2ASIA = The region includes most Asian countries with the exception of the Middle East, Japan and Former Soviet Union states. R5.2MAF = This region includes the countries of the Middle East and Africa. R5.2LAM = This region includes the countries of Latin America and the Caribbean. R32ANUZ = This region includes Australia and New Zealand. R32CAS = This region includes the countries of Central Asia. R32CHN = China (Mainland, Hongkong, Macao; excl. Taiwan). R32EEU = Eastern Europe (excl. former Soviet Union and EU member states). R32EEU-FSU = Eastern Europe, former Soviet Union (excl. Russia and EU members). R32EU12-H = New EU member states that joined as of 2004 - high income. R32EU12-M = New EU member states that joined as of 2004 - medium income. R32EU15 = This region includes European Union member states that joined prior to 2004. R32KOR = Republic of Korea. R32LAM-L = This region includes the countries of Latin America (excl. Brazil, Mexico) - low income. R32LAM-M = This region includes the countries of Latin America (excl. Brazil, Mexico) - medium and high income. R32MEA-H = This region includes the countries of Middle East Asia - high income. R32MEA-M = This region includes the countries of Middle East Asia - low and medium income. R32NAF = This region includes the countries of North Africa. R32OAS-CPA = This region includes the countries of Other Asia - former Centrally Planned Asia. R32OAS-L = This region includes the countries of Other Asia - low income. R32OAS-M = This region includes the countries of Other Asia - medium and high income. R32PAK = This region includes Pakistan and Afghanistan. R32SSA-L = This region includes the countries of Subsahara Africa (excl. South Africa) - low income. R32SSA-M = This region includes the countries of Subsahara Africa (excl. South Africa) - medium and high income. The definition of low, medium and high income countries is based on the country grouping that was established for characterizing the variation of economic growth scenarios for the different SSPs (see Supplementary Note, pg. 11). Please note that country level data are denoted by ISO 3166-1 alpha3 three-letter country codes. A detailed (MS Excel) mapping table is available here.